Week of 23-29 April – Our turtles really picked up this week, after several nights last week with few turtles. We’ve now seen 23 individual leatherbacks since 18 March, and we’ve seen some of them now 4 times nesting at Sandy Point. We started the week with a beach cleanup within our patrol area, picking up trash that had floated in as well as removing some sticks and logs and hazards that are difficult for the turtles to climb over and difficult for us to see in the dark! Sunday night was quiet and then we had a rush of turtles starting Monday night. Below is a summary of a few of our remarkable sightings from this week. Scooter and Marsha both came in on Monday night – Scooter is named after our energetic volunteer Louisa, and this was her first nest this year at Sandy Point. She nested 4 times in 2013, which was when she was originally tagged. Marsha is one of our faithful turtles this year, she came for her third nest and she’s also a 2013 turtle. Marsha’s nest had to be relocated to a safer place on the beach. For her nest, she chose a part of the beach that will have eroded away by the time her eggs are due to hatch – we know this from the decades-old pattern of how this beach shifts around. So we move her eggs to a section of beach that doesn’t erode so that it will produce some hatchlings. Tuesday was a busy night with 4 turtles! We saw Felicia, Nina, Sheila and Kanga – We have seen Nina before this season – just once – 13 days ago. 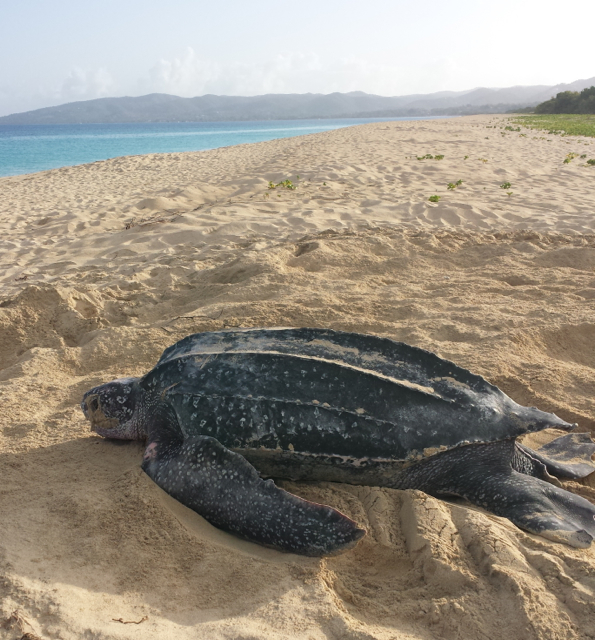 She was a bit overdue (leatherbacks nest every 9-10 days during the season) but sometimes that happens. But a possible explanation for why she was a little late became clear when we saw her. She had cuts, scrapes, and bites that are consistent with a shark attack. Scraping teeth marks covered the top and bottom of her big head and she had been banged up quite a bit. We take careful notes on injuries seen on our turtles, so that we can evaluate the kind of threats our turtles face. However, they do heal quickly and have an amazing ability to ignore what has happened to them and keep nesting. We’ll keep an eye out for Nina the next time to see how her wounds have healed. It’s been a rainy end to the week here in St. Croix, and that interrupts our patrol schedule a bit. But the team is hopeful and a little rain is not going to keep them from doing a great job out there!